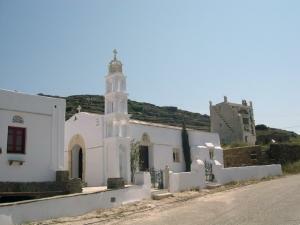 While you explore the island and admire its many churches, both large and small, you might be interested to take a look inside and take some photographs of the beautiful interiors. 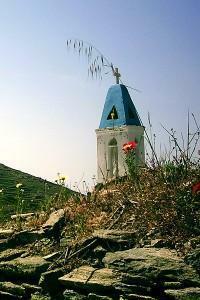 Most of the large village churches are open to the public. 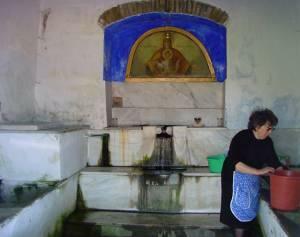 If there is a caretaker on the premises, be sure to ask if it’s permitted to take photos before clicking away. 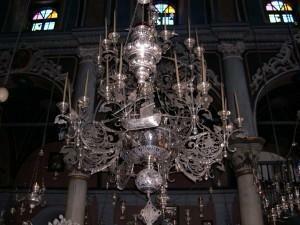 Some churches permit photographs, but not with a flash. 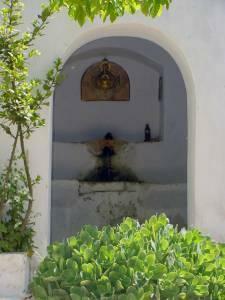 And some might not allow any photo to be taken under any circumstances. 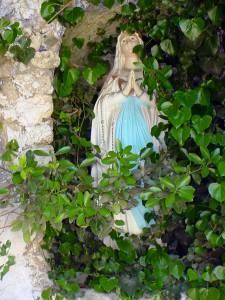 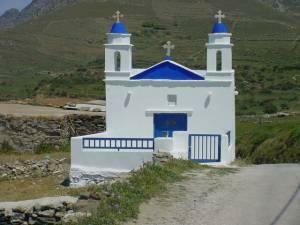 You will most likely find that very small churches (many belonging to private families) are locked and shuttered. 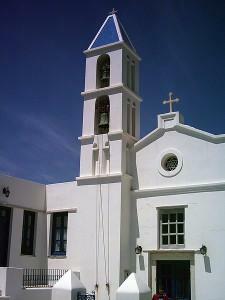 You can always ask around locally if someone has a key and wouldn’t mind allowing you access. 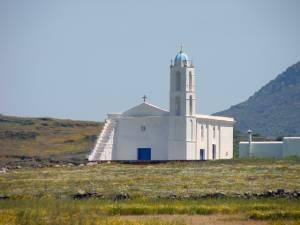 Also, while you’re visiting the island, you may wish to attend church services. 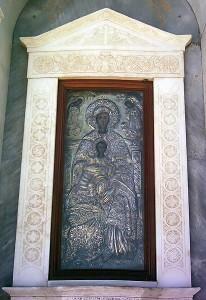 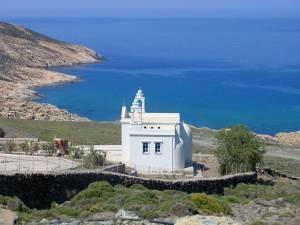 You can do this at both the Orthodox and Catholic churches in Tinos Town. 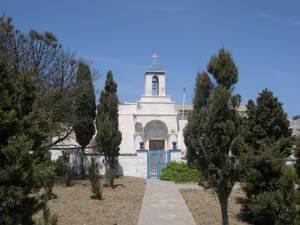 The Church of the Panagia (Orthodox) offers a daily liturgy at 07:15, and conducts evening prayers at 17:30. 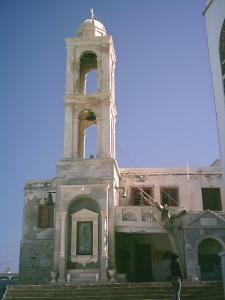 The Catholic Church of St. Nicholas (Ag. 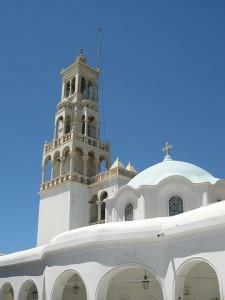 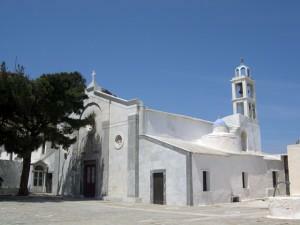 Nikolaos), also right in town, has a Mass scheduled every Saturday at 20:00, and every Sunday at 10:00. 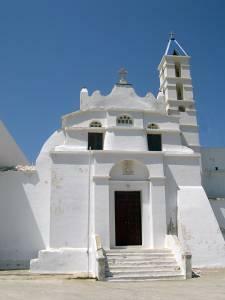 Masses on feast days will be celebrated at either St. Nicholas, or at the Church of St. Anthony, in the Pallada area of Tinos Town. 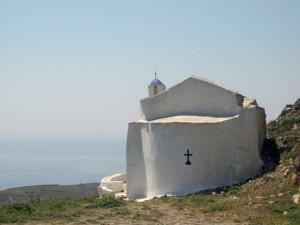 This lovely little church can be found just across the road from the Monastery of Kechrovounie. 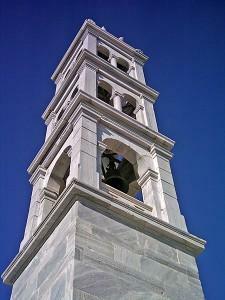 Marvelous steps leading to the roof affording access to ring the churchbell. 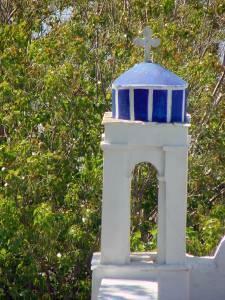 We couldn't resist the unusual detail on the roof of this village church. 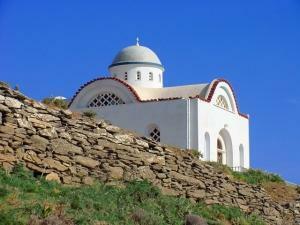 This must be one of the most beautiful churches on the island, and the setting is magical. 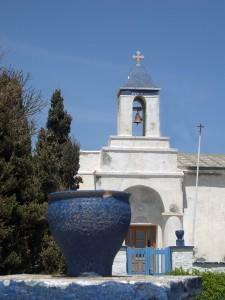 No official count of all of the churches and chapels on Tinos has yet been made, but we're sure that there are more than 1,000. 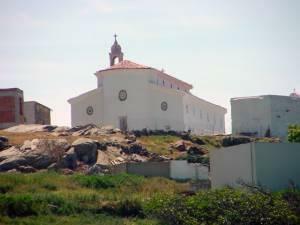 Note that the two church crosses together face north, south, east and west. 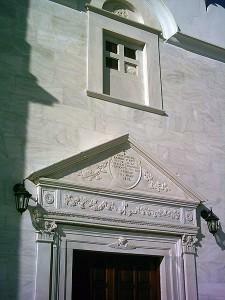 This perfectly symetrical church and small entrance courtyard is contrasted with the three differently shaped crosses atop the cornice and the two steeples. 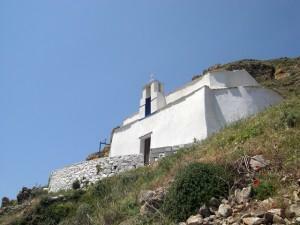 The simplest church (in this case chapel) will celebrate its "Name Day" once a year, with family and friends in attendance, and often with a lovely meal and plenty of wine. 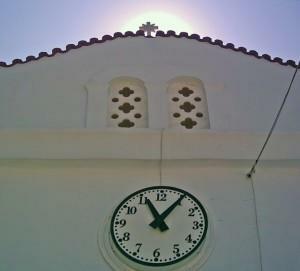 The major exterior renovation of this large church has yet to include the old steeple. 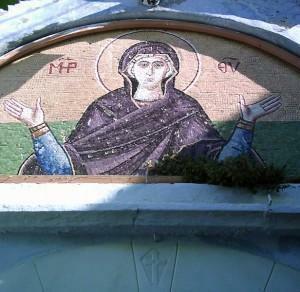 This excellent photo from above and behind the church shows the Byzantine architectural details of the barrell-shaped vaults which are typical of Orthodox church construction. 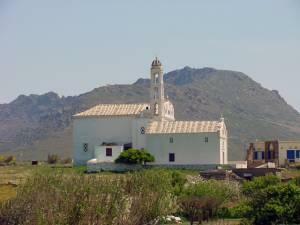 Here's a side photo of the above church highlighting its fantastic position relative to nature. 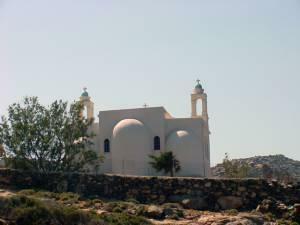 This is a closeup of the rear of the previous church showing its twin steeples and triple vaults. 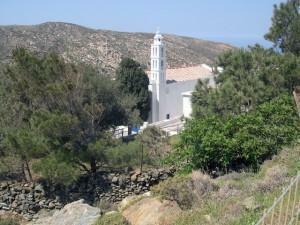 Side by side, here are the three main structures of Tinos; a simple village house to the left, the lovely parish church in the middle, and the ever-present Tinion dovecote to the right. 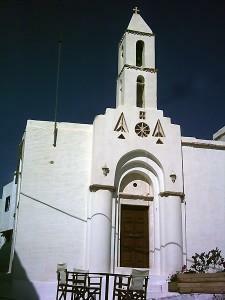 We couldn't resist taking of photo of this lovely church, with its 'fingers' reaching toward the heavens. 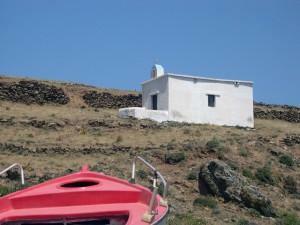 Crosing the island toward the north, this private chapel sits right alongside the main road. 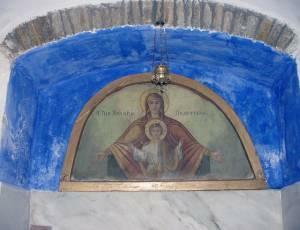 It's freshly painted and waiting for its annual feast day. 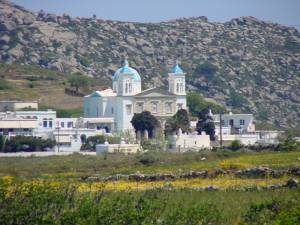 As you drive throughout the island, you'll be surprised how many churches pop into view, almost springing up from the nature that surrounds them. 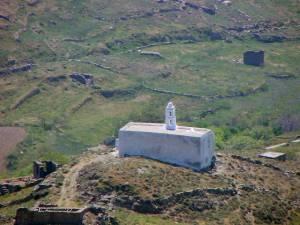 Please note that 'Kardiani' name comes from 'Kardia' [=Heart]. 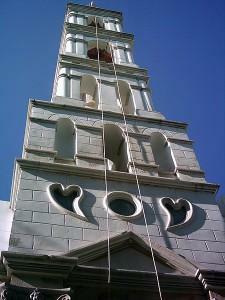 Thus the two artistic hearts are very justifiably placed here! 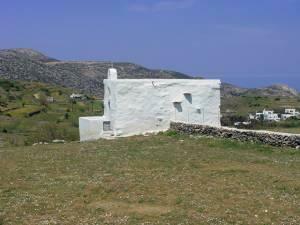 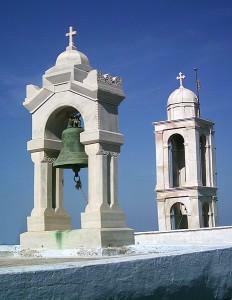 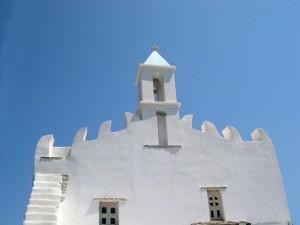 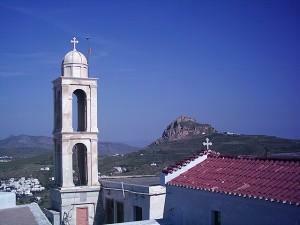 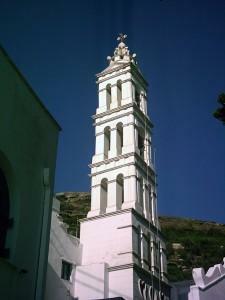 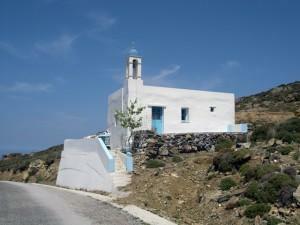 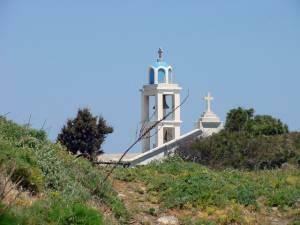 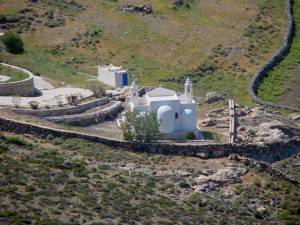 Tinos: The bell Tower of humble Zoodochos Pighi Chapel near Berdemiaros Village. 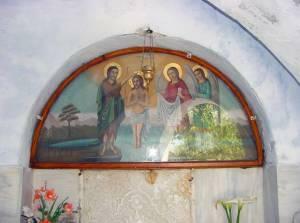 One could hardly imagine, judging from the outside of the chapel, of the fantastic frescoe decoration of the interior! 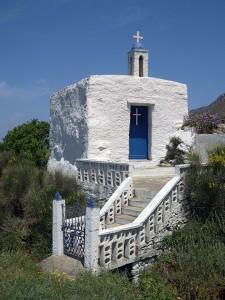 A fancy staircase contrasts sharply with the simple style of this private chapel. 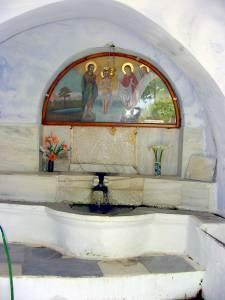 The smaller spring in the village square of Dyo Choria, with its lovely icon.